Luxury Swiss watchmaker TAG Heuer will next week launch a smartwatch aimed at taking on the Apple Watch, but with an asking price of $15,000, the company chief said in an interview published Sunday. Jean-Claude Biver told the Le Matin Dimanche weekly that the titanium Carrera Connected watch would hit stores in New York at noon (1700 GMT) on Monday. Three days later, the new watch will come to Europe. “Our watch will have almost the same functions as an Apple Watch, but I don’t want to divulge too much,” he said. TAG Heuer has joined forces with technology behemoths Google and Intel to develop a connected watch able to claw back some market share from Apple, which has shipped millions of its smartwatches since launching six months ago. TAG Heuer’s new watch will meanwhile target a more high-end clientele than the average Apple Watch buyer. It had been rumoured to go for $18,000, but Biver said in Sunday’s interview it would carry a price tag of $15,000 (14,000 euros). “The Carrera Connected is an exclusive, luxury watch,” he said. In comparison, it is possible to acquire an Apple Watch for under $400, although more exclusive models can cost around $17,500, he pointed out. 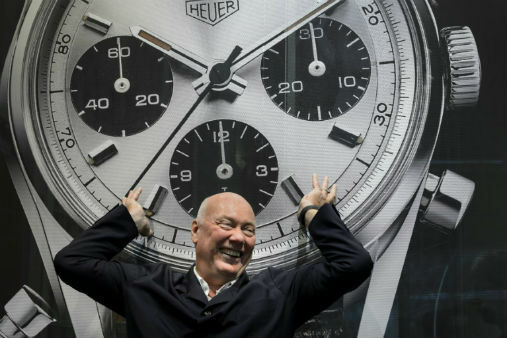 Biver, an industry legend who also leads the watch division of TAG Heuer’s owners LVMH, insisted that he does not consider Apple a direct competitor. “We are not Apple. We are a watch brand. I forbid my colleagues to say Apple is our competitor,” he told the paper. He acknowledged that the two companies were engaging in “similar work”, but stressed TAG Heuer had no interest in selling millions of connected watches. For its New York launch on Monday, the brand will make nearly 1,000 of the connected timepieces available, he said. The new TAG Heuer watch is based on the brand’s Carrera classic model, Biver said, insisting that at a distance the two could not be told apart. But like the Apple Watch, the Carrera Connected is able to connect wireless to a user’s mobile phone to provide a range of functions, Biver said. “It does not just count your steps or take your pulse,” he added. Buyers will be able to choose between six brightly colored wristbands, and the appearance of the face of the watch can be modified just like the screen on a mobile phone, he said. Duterte: Want virgins? Don’t die for Islam, come to the Philippines!